In the late 90’s, a franchise called Harvest Moon created a groundbreaking subgenre: the farming simulator. Long before Facebook games had you taping on crops, Harvest Moon was a JRPG style game where you walked around a big empty plot of land, planted crops, took care of animals, went fishing, explored mines, and won women’s affection. And then the DS era began and the franchise took a turn for the less good, becoming less about creativity and time management and more about goofy minigames. 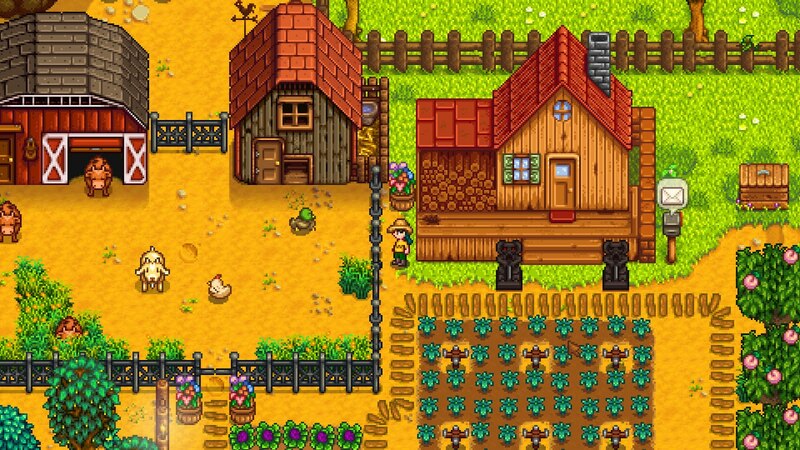 Stardew Valley is in indie game that goes back to the basics of Harvest Moon and brings the original vision into the modern gaming world. 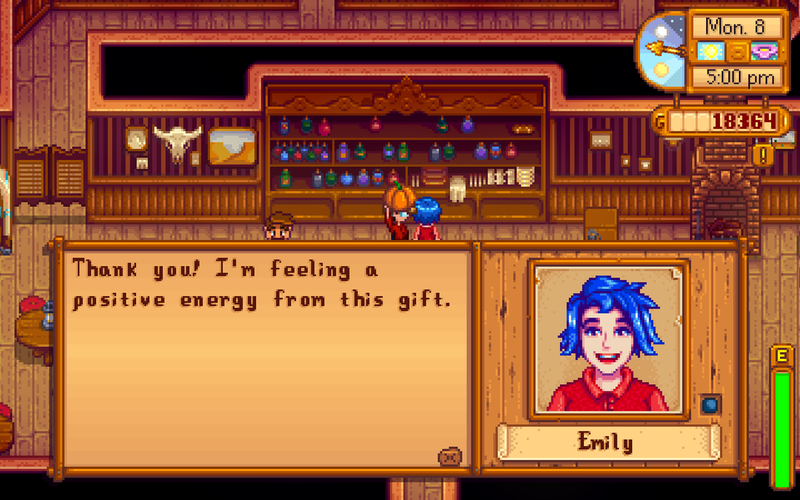 I love Stardew Valley. It’s everything I loved about older Harvest Moon games times ten million. All the little nitpicks and gripes I had about Harvest Moon are removed or edited. You can walk through your crops so you can water the inside of the field. You can plant individual seeds so crop layout is more precise. Plus, you can plant virtually anywhere on your farmland while also building other structures, tools, and machines. The game borrows just the right amount from Minecraft, namely the way item management works. No more planning out foraging or mining trips based on how much you can carry. Bring 999 bottles of milk in one square, compared to dragging around 9 pieces in Friends of Mineral Town (or 8 if you want to talk to people without gifting an item to them). Chests can be crafted early in the game, and store any item - so you don’t have to wait until you own a fridge to store food. ​The Harvest Sprites, which would do chores around the farm for you, are not replicated in Stardew Valley. Their supernatural aspect is filled by weird fruit spirits that accept offerings of rare items in exchange for big changes in town. These rewards include repairing a bridge to a quarry and repairing a bus that leads to a desert. Since their are no Sprites to do chores for you, tools can be constructed in their place, such as sprinklers that water crops every day. Romance is present in the Valley as well. Unfortunately, it’s the “give gifts” method of wooing. I would prefer something like The Sims where you pick topics and get to know details that way, or answer and ask different questions. One nice thing that was carried over is Heart Events, which are cute cutscenes that occur when you are at the right place in a relationship (read: have given them enough gifts.) Unfortunately, other villagers you aren’t romantically involved with do not pair up with each other. The social aspects of Stardew Valley are flawed compared to older counterparts. In Friends of Mineral Town, every character had a well defined role in the town. The blacksmith’s apprentice, the innkeeper’s daughter, etc. I’ve played Stardew Valley for over two in-game years and of the ten marriage candidates only Penny seems to have a job, tutoring the kids, and I get the vibe she does that for free. Everyone else just seems to be teenagers living in their parent’s house and the parents don’t work either. I think. That fact that I’m not sure is part of the problem. 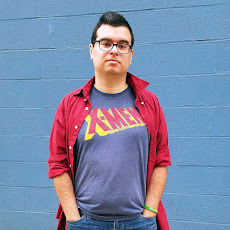 Some bigger complaints involve features that are almost entirely unnecessary. In old school Harvest Moon you could go into the mines and collect ores and rare gems. In Stardew Valley you can go into the mines and collect ores and rare gems, as soon as you’ve cleared the area of vicious monsters by fending them off with swords! The combat is decent, but it doesn’t need to exist - at all. Initially, I was turned off by the unnecessary combat, but I have come around to liking it well enough. This isn’t a Harvest Moon remake. It adds elements from other games, like Minecraft. So I’ll give the combat a pass. However, it’s a pain to have to plan out a mining trip by also planning to bring health restoring items, weapons, and an escape plan. A bigger issue I have is with the fishing element of this game. It is nearly impossible. 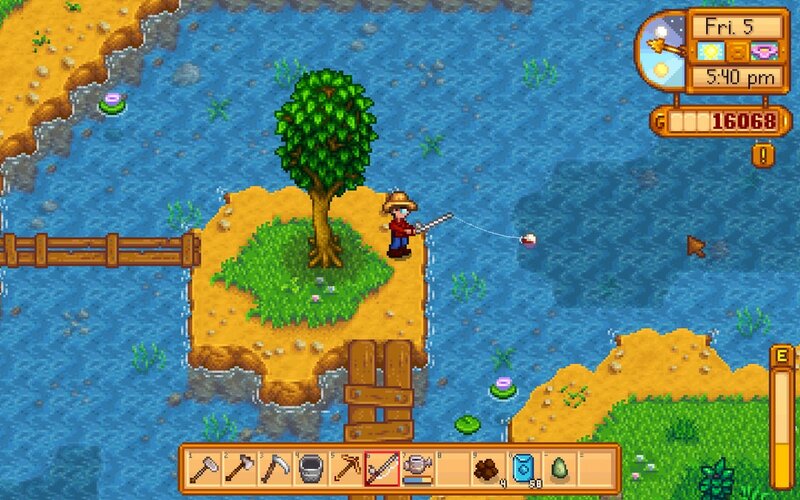 Many simple fishing mini games have you just waiting to press a button when you get a bite, but Stardew Valley adds reeling the fish in as well. Fair enough. But at first I had no idea how it was supposed to work. I did some Googling and found a million posts about this same issue. At first I was relieved I wasn’t the only one,but for every thread saying fishing is impossible there are twenty comments from people saying they are whining.The key thing I’ve gathered is that it gets easier (that’s not how games work, but okay) and as you catch more fish you level up the fishing skill and unlock better poles and bait to make it easier. Eventually I managed to catch a few things and, as I got the hang of it and leveled up to unlock better rods and bait, fishing did become easier. However, the curve seems backwards. Something in a video game should start off easier and gradually become more challenging, not appear impossible and eventually become a cakewalk. In the end, Stardew Valley is amazing and offers hundreds of hours of playtime and replay value. 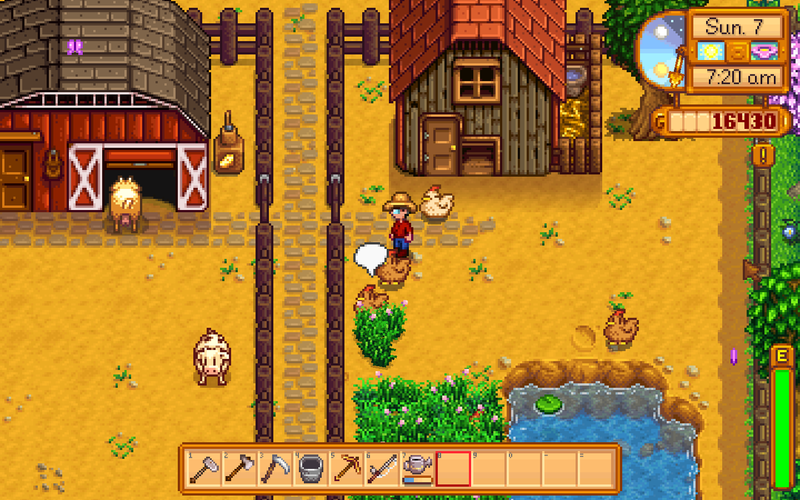 In addition to spending hours and hours unlocking everything and building a perfect farm, you can restart the game with different types of farms that are primed for certain kinds of play styles. And there are dozens of weird hidden secrets lying around, statues,meteorites, and all kinds of strange and unexplored environments. There are apparently mods on Steam so that’s a whole other world to explore. Finding rare ores is satisfying. Uncovering hidden treasures is satisfying. Even something as simple as watering crops is satisfying. And that’s what we want: a simple life on a farm. 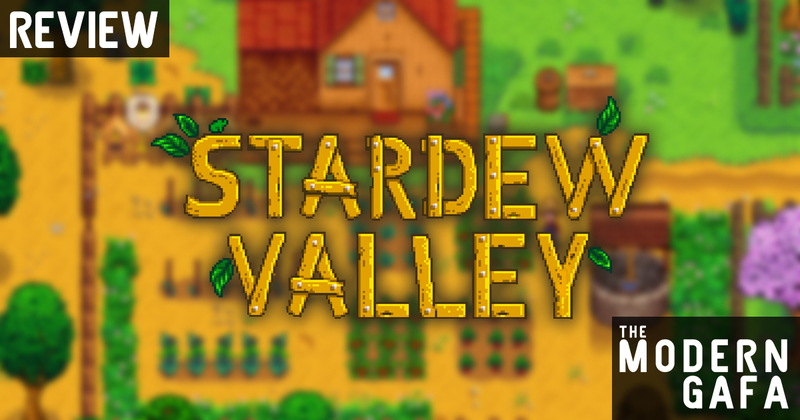 Get Stardew Valley on PS4 today!